Situated on an elevated lot Bonitas Winery located in Summerland, has a scenic overview of Okanagan Lake. 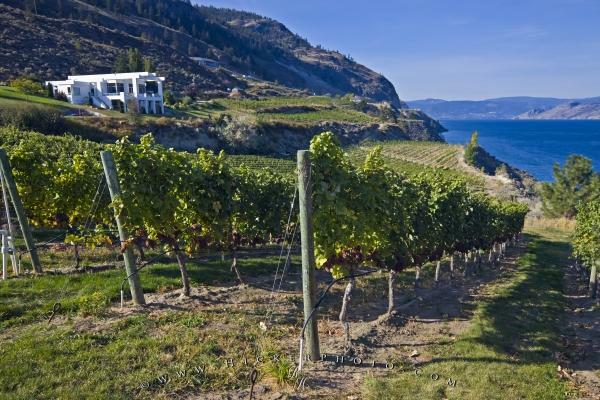 A winery with a beautiful over view of Okanagan Lake and the Valley, Bonitas Winery is situated in the scenic community of Summerland. Perfect growing conditions in the Okanagan Valley and on the banks of the lake make this region the fruit basket of British Columbia. Summerland is a scenic area which is home to many wineries and vineyards. Rows of grapevines at Bonitas Winery, Summerland, Okanagan-Similkameen Region, Okanagan, British Columbia, Canada. Picture of Bonitas Winery in Summerland with a scenic view of Okanagan Lake.